Discover the benefits of vinyl fencing. If you’re looking to add or upgrade your home’s fencing this summer, you have plenty of things to consider. Style, height, maintenance, and ease of installation are only half the battle, the first thing you’ll need to think about is material. One popular choice is Vinyl. Not only is this trendy material great for your budget, but vinyl allows you some creative leeway in other areas as well. From installation to your maintenance routine, vinyl fencing is one of the easiest to care for. If you intend to DIY, a vinyl fence comes in prefabricated segments that will slide into place quickly. This makes it one of the easiest types to install on your own, no cutting, painting, or sealing required. Once you’ve got your fence assembled care is easy too. Just hose it down if it gets muddy! With such an easy set up you might be concerned about the longevity of your fence, but never fear. A vinyl fence given proper care will last 20-30 years. Given the lower price point, the ease of maintenance and the easy installation it’s an excellent choice for an all-purpose fence. With a vinyl fence, you have plenty of options for design! Different colors, shapes, heights, textures, toppers, and finishes are all possible and more easily affordable when you choose vinyl fencing. 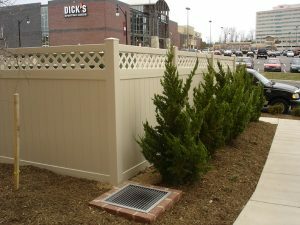 You might even consider matching your fencing to the style of your home or the surrounding fences of your neighbors. One of the most significant advantages of vinyl fencing is that it holds up to far more than other options. You’ll never have to worry about rust or paint chipping. It’s also pest resistant and cannot rot, mildew, or decay. It indeed is one of the easiest to use options available on the fencing market today. If you want to know more about whether or not vinyl is the right material for your home fence, Hercules Fence is ready to help you get the look and function you desire. Hercules Fence has extensive experience in repairing and constructing fences made out of any and every material. Our experienced team can help meet your fencing needs, whether they’re residential or commercial, for the right price. Give us a call at 757-316-3600 or visit us online. To see examples of our work and keep in touch, don’t forget to follow us on Facebook, Twitter, Google+, LinkedIn, Flickr, and Pinterest. This entry was posted on Friday, May 25th, 2018 at 11:03 am. Both comments and pings are currently closed.